GCU holds the line on tuition for 10th straight year. 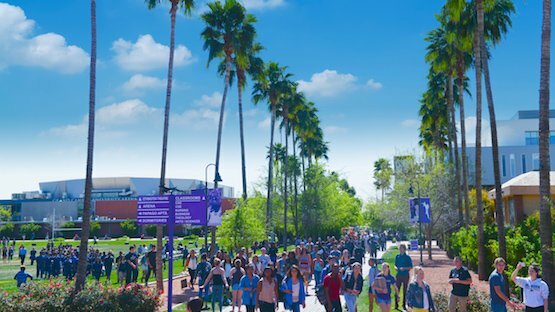 “Ten years without raising tuition on our ground campus, with only minimal increases in online tuition… that’s unheard of in higher education,” said GCU President Brian Mueller. As tuition increases force families to dig deeper into their pocketbooks, Grand Canyon University has redoubled its commitment to making college accessible and affordable. The private Christian university will freeze tuition on its ground campus for the 10th consecutive year and hold the line on the cost of room and board as well. That means tuition for existing and incoming students will remain at $16,500 for the 2018-19 school year, though the vast majority of students – more than 90 percent – receive institutional scholarships that bring the average tuition cost to approximately $8,600, which is on par with public universities and well below other private schools. That total does not include federal aid such as pell grants and subsidized student loans or external scholarships that lower students’ out-of-pocket expenses further. According to “Trends in College Pricing” released by the College Board last week, the average annual cost to attend a four-year public college in 2017-18 rose 1.3 percent to $9,970, while tuition and fees at four-year private institutions increased by 1.9 percent to $34,740 during the same period. Over the past decade, tuition has risen 37 percent and 26 percent at four-year public and private universities, respectively, while the cost to attend GCU has remained unchanged. As a result, students at GCU are incurring less debt (an average of $18,750) than the average at public universities ($25,550) and far below the average at nonprofit private universities ($32,300) or for-profit colleges ($39,950), according to data from the Institute for College Access and Success. As a case in point, Mueller pointed to GCU’s hybrid model that serves both traditional and online students. “By leveraging a common infrastructure across two distinct student bodies, that creates tremendous operational efficiencies that have kept tuition costs low and enabled us to invest a record $1 billion in new programs, technologies and facilities during the past 10 years,” he said. Major renovations of a 152-room hotel and championship golf course. All of that has been accomplished in the past 10 years without passing those costs on to students via increases in tuition. Just over a decade ago, GCU teetered on the edge of bankruptcy. Today, the university boasts more than 91,000 students (72,000 online students in addition to the 19,000 traditional students on its west Phoenix campus) and employs more than 10,000 people, making it one of the largest employers in metropolitan Phoenix. According to a study by Elliott Pollack & Co., the university also contributes $1.1 billion to the state and local economy each year. In the past 18 months, GCU has also launched eight new business enterprises – a hotel, golf course, two public restaurants, a coffee company, a merchandise/promotions company, an advertising agency and a music recording entity. In addition to providing learning opportunities for students and jobs for residents in GCU’s surrounding community, the revenues from those operations are reinvested into the university and help hold the line on tuition.